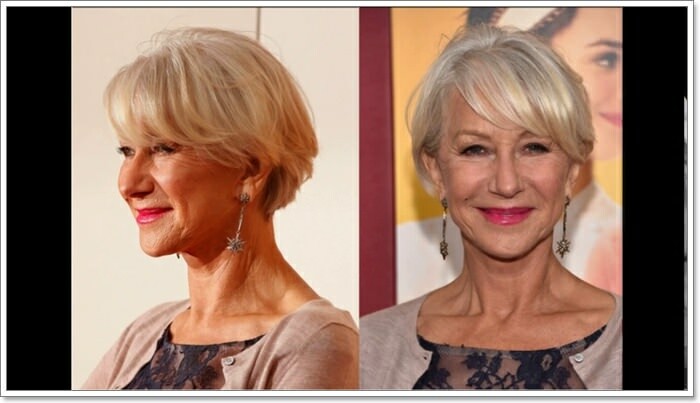 Are you getting bored with the same hairstyle for long but haven’t found a look that is quite age appropriate? 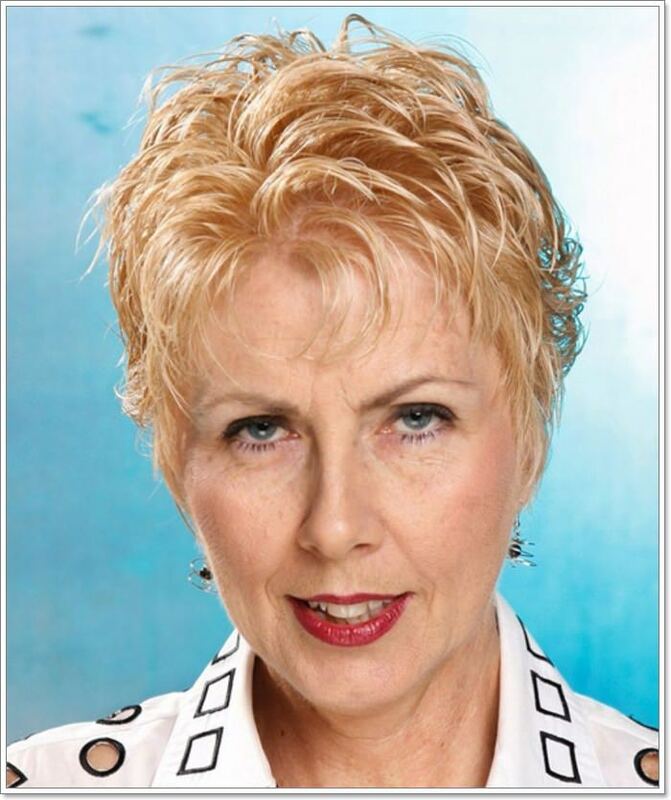 Just because you are sixty doesn’t mean you have to settle for boring hairstyles. 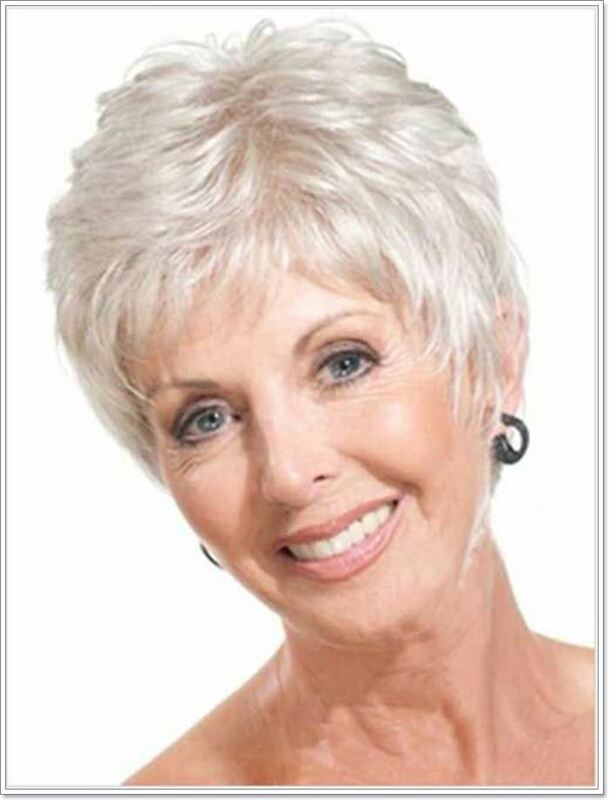 There are plenty of hairstyles for women over 60 that can meet your needs. You can easily change your hairstyle and be as daring or as fun and flirty as you desire. You can experiment with cuts and colors that will add texture and dimension to your hair. Choosing the right hairstyle will make your features stand out and highlight your facial features. Being 60 doesn’t mean that your days for hair experiments have passed. As you get older you start to feel like a lot of hairstyles will not suit you. 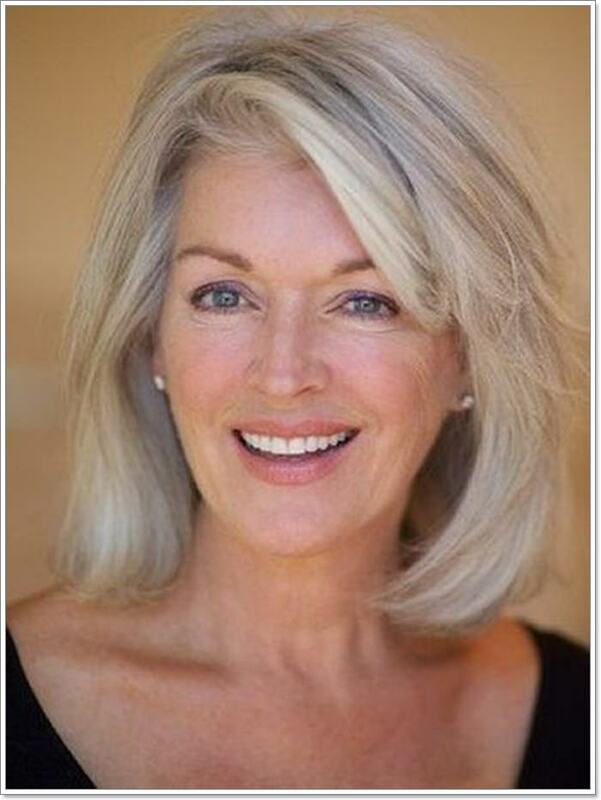 Of course, your facial features and body start to change when at that age and so should your hairstyle. By the time you reach this time of your life, you have much experience about hairstyles and know what will and what won’t suit you. This makes it easier for you to choose hairstyles. 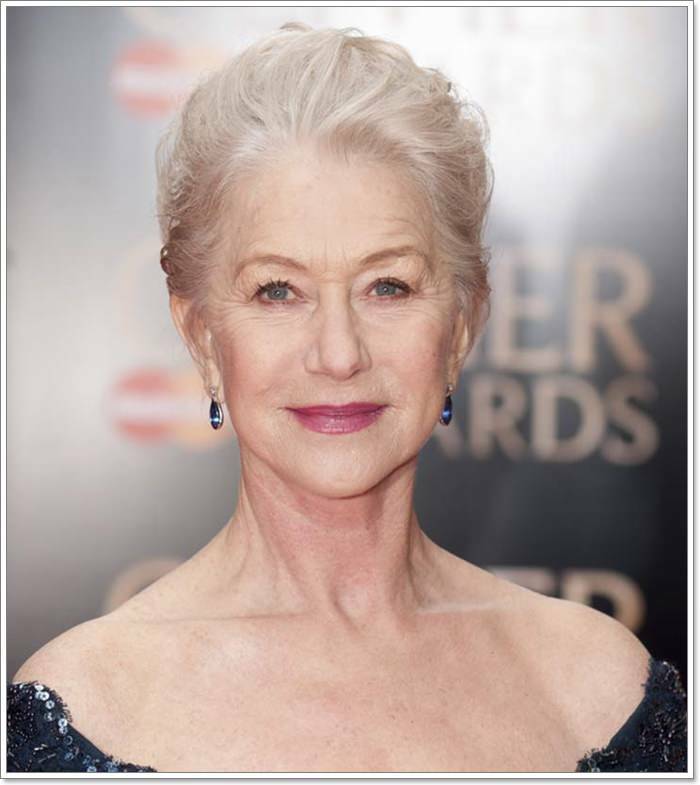 Here are 65 beautiful hairstyles for women over 60 that will give you the inspiration that you need. This is an inspirational short hair idea that is perfect if you have short layered hair. This low maintenance hairstyle was sported by so many women very gracefully over the years. Try this if you have short hair. 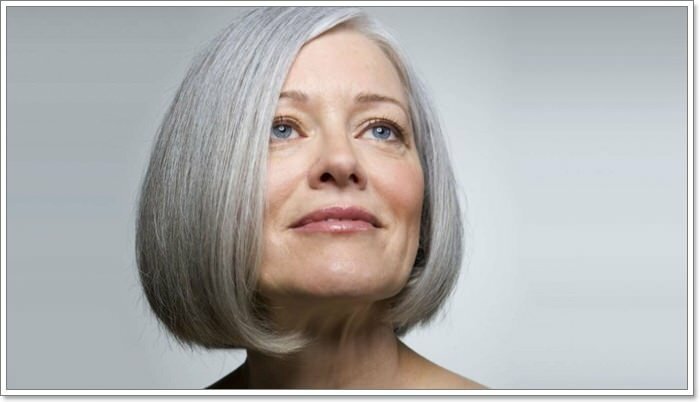 As the years go by the natural hair color slowly strips away, and you are left with some gracious grey hair. 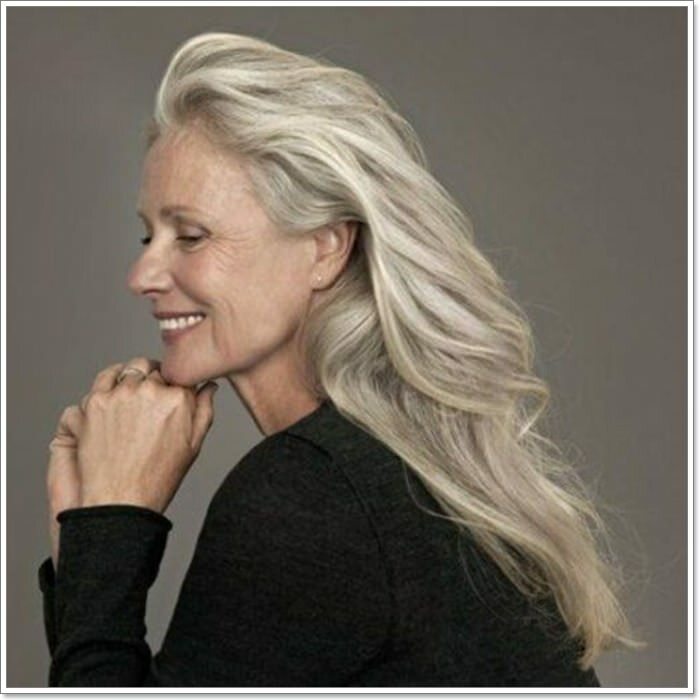 Own this look and style your long grey hair by placing it casually to the side. The long bob is a very versatile hairdo. It is perfect for women who want to keep a bit of length in their hair. This bob has bangs on the front swept to the side that frame the face and it looks great. This is another bob hairdo that is perfectly chic and casual. This brownish hair color perfectly complements the pinkish pale skin tone. There are slight waves in this hairstyle at the bottom that add a very feminine touch to the look. 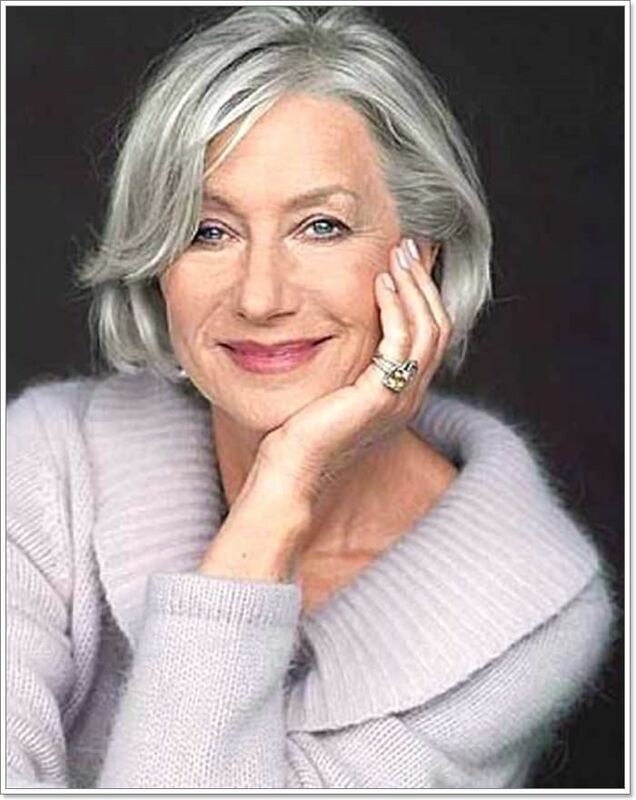 Helen Mirren has had very sophisticated hairstyles over the years. 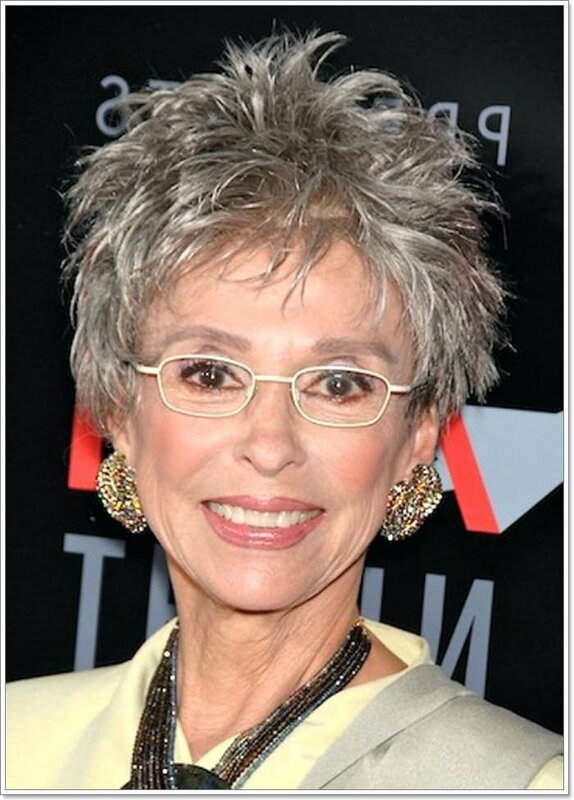 The beautiful actress inspired for so many women over the years to try on short and sleek hairstyles. 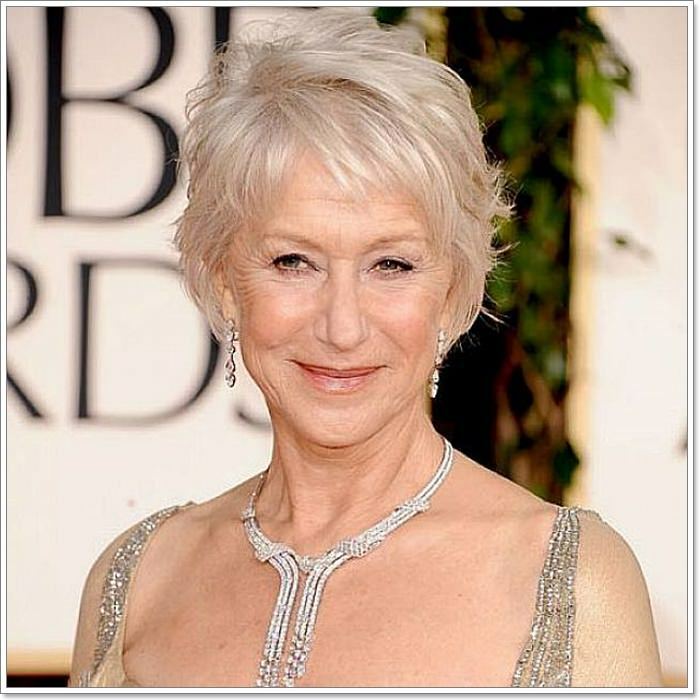 She has sported so many suitable hairstyles for women over 60. Here she has short hair with bands styled by creating inward waves. This look is so well put together. Here she has styled her short hair with multiple layers, and they are placed on the front to add texture and dimension. The bright blonde hairstyle has complemented her perfectly and is very suitable for women with short thin hair. If you are tired of coloring your grey strands all the time, then you should opt for this look. 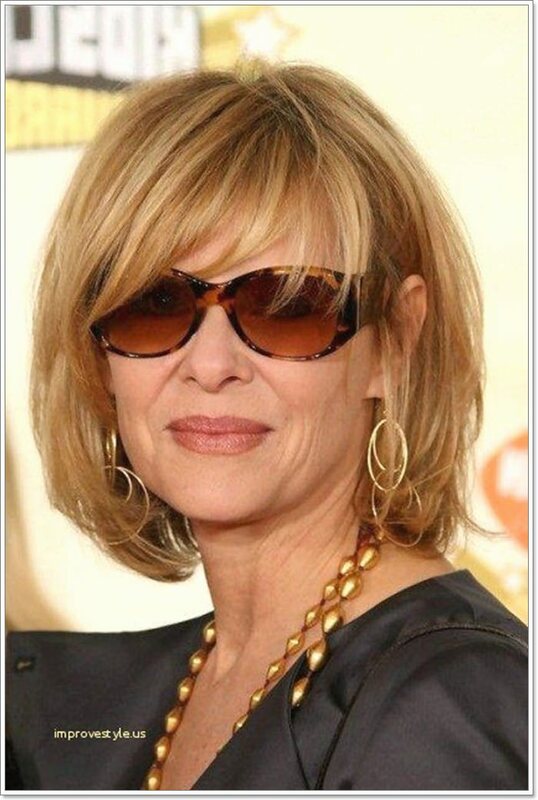 This is a classic short bob hairstyle that looks great with grey hair. Copy this hairstyle and enjoy the effortless look. 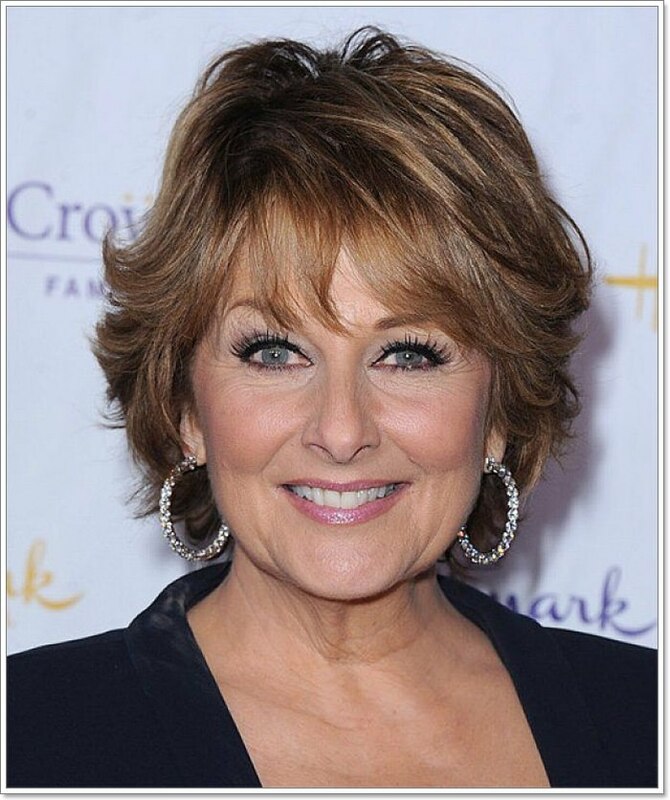 Helen has sported hairstyles for women over 60 that are very gracious and pretty. This is one such hairstyle. There is some volume on top and the pulled back bun hairdo looks great on her. Try this for a hassle-free look. 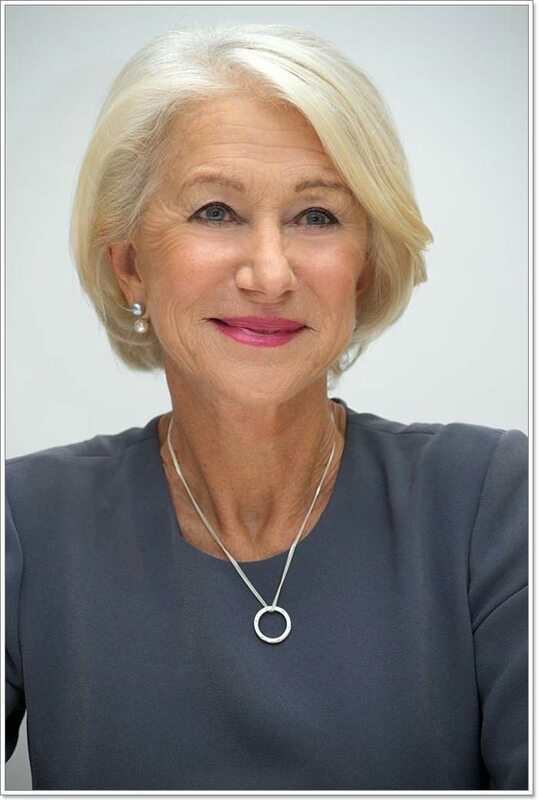 Helen Mirren is the ambassador of sophisticated hairstyles. She wears hairstyles that are easy to create and carry throughout the day. She makes even basic hairstyles look very feminine. The ease with which she carries these hairstyles is commendable. This short pixie haircut has so many layers. We love the fact that this is a carefree low maintenance hairstyle that needs no styling once its cut. Try this if you have thin hair and want a fuller look. This is a very well styled hairdo. There is a curvature on the sides of this bob that adds needed volume to the hairdo. The hair at the base styled into inward waves makes it looks fabulous. 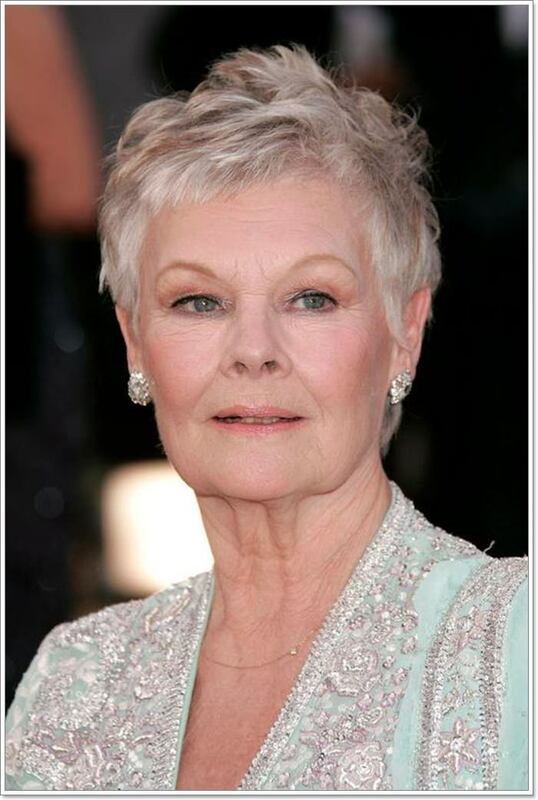 Judi Dench has sported short hair for a very long time. This pixie cut is very easy to create and needs minimal styling each day. There are spikes on top that add the much-needed edge to the hairstyle. No matter what angle you view this hair from, it will look amazing. 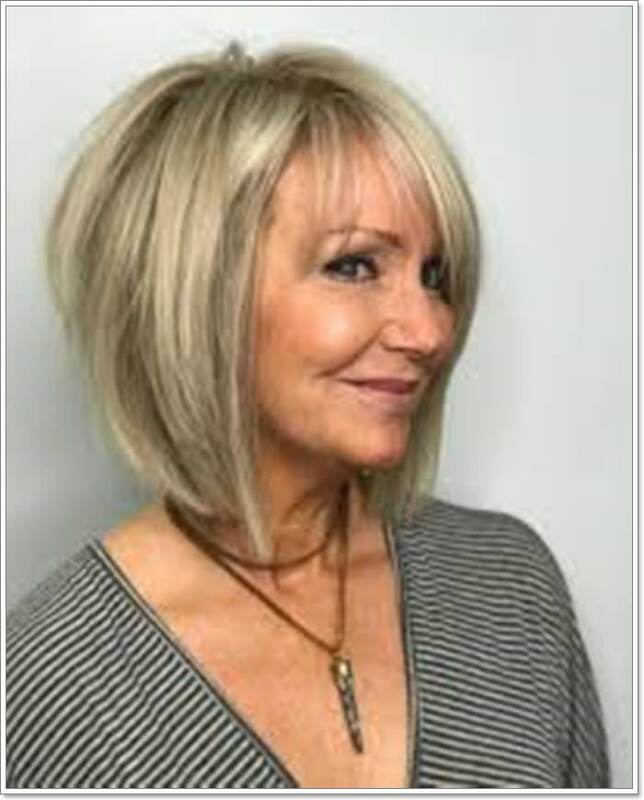 This look is a perfect hairstyle for women over 60 who want low maintenance and no hassle hairdo. Try this look and we are sure you will love it. If you want a hairstyle that has a bit of an edge you can choose this short pixie cut with bangs on the forehead. The hair seems to be perfectly styled even if you have just woken up and we love that. The bob has always been a favorite hairstyle among ladies. It has a very different appeal and looks good on almost all face shapes. You can add layers and style them in waves or add bangs to make this hairstyle exquisite. This hairstyle has waves that go outward and we love the detail. There is some volume on top that adds a thick hair effect. There are dark and lighter streaks of hair that add so much depth to the look. 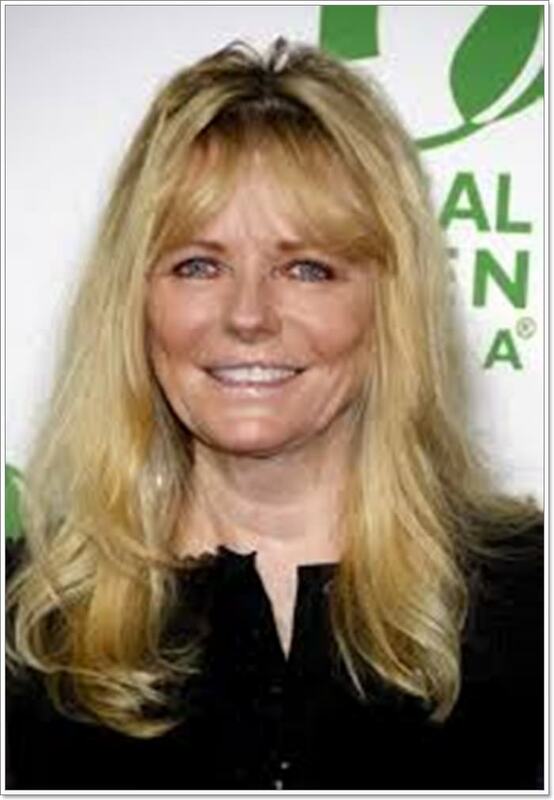 Blonde hairdos are a classic color choice for hairstyles for women over 60. This is a very glamorous look with streaks of blonde hair and bangs. The straight hair looks great with inward curves on the end looks stunning. 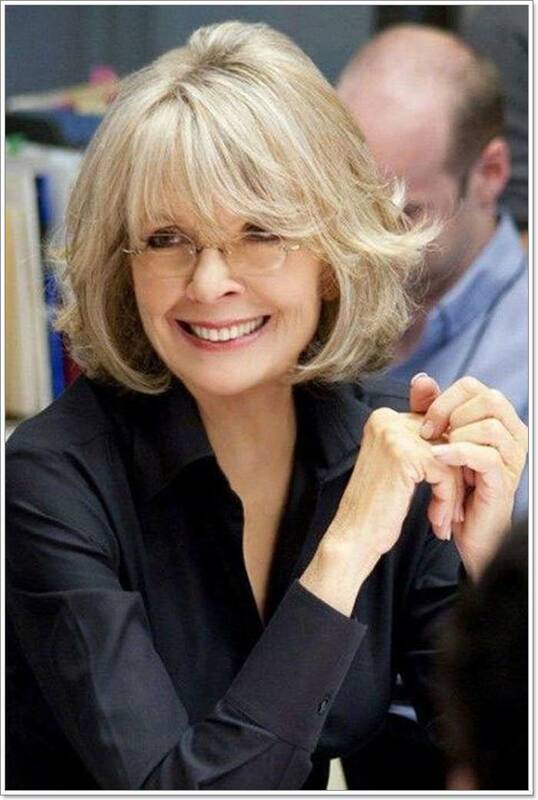 Medium length of hair is very suitable for older women. There are multiple layers in this hairstyle and we love the way the strands are multi-directional. You can easily sport this hairstyle and go around with your chores. There is something that is so attractive about natural hair. This particular hairstyle inspires us to accept our natural hair and sport it with elegance and ease. 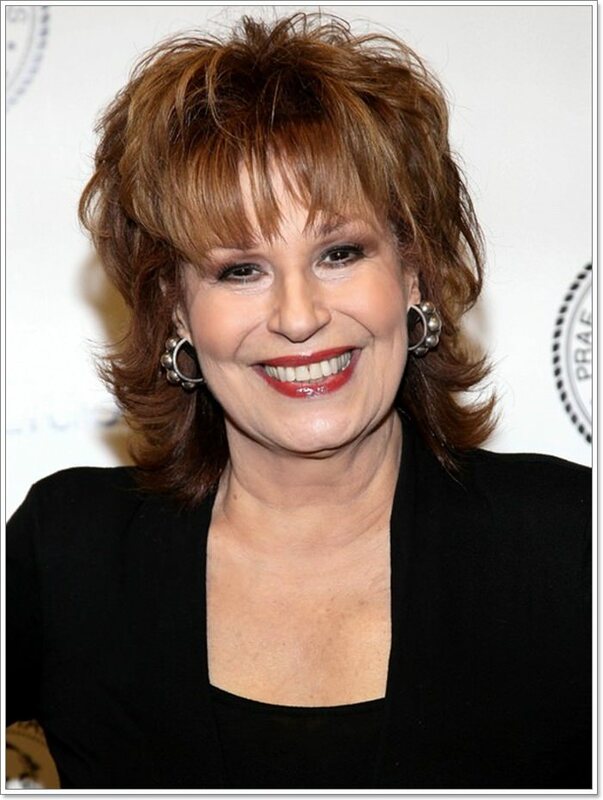 This is a great example of hairstyles for women over 60. 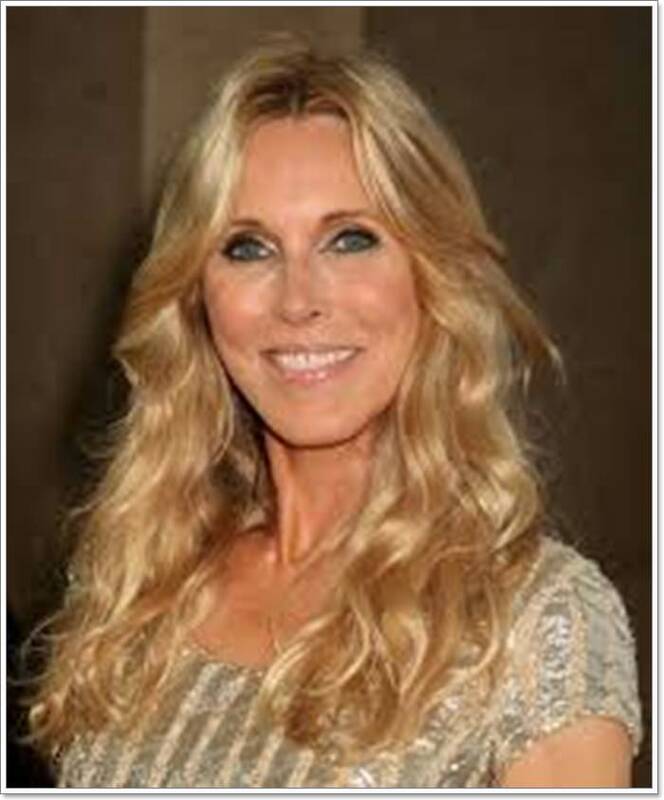 Farah Fawcett’s hairstyle has been sported by so many women over the years. This look had so many layers in them and looks amazing. This is one of the most famous hairstyles for women over 60 in the ‘80s. 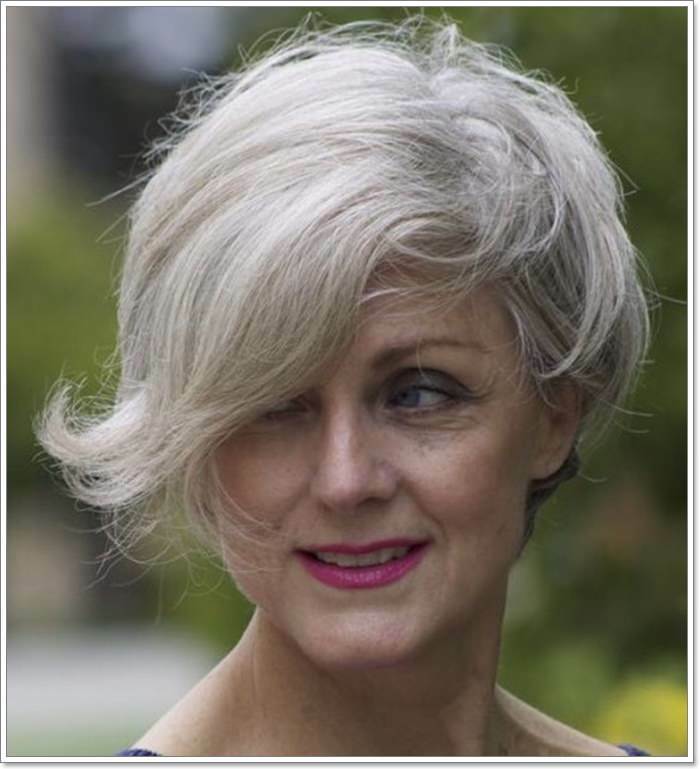 Try this bold hairstyle and showcase the fact that you are still young at heart. 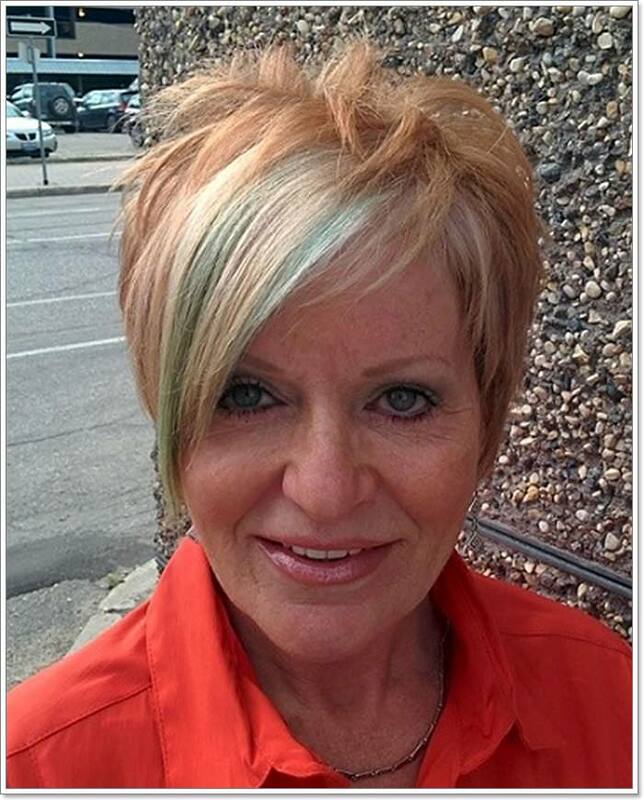 The short hairstyle with bangs and layers are lifted to a whole new level with the green/ teal colored highlights. This hairstyle is for the ones who aren’t scared of making bold choices. 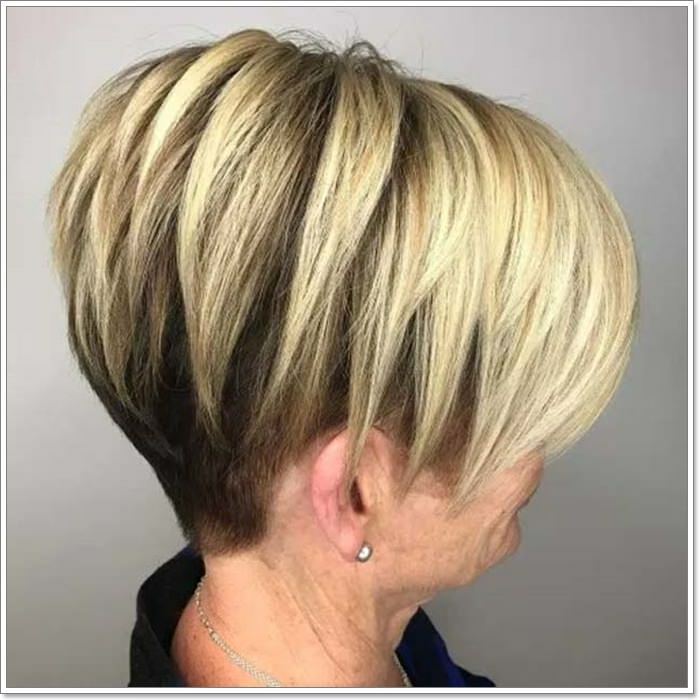 There are multiple layers in this look and it falls under the best hairstyles for women over 60 who desire short and lively hairdos. You can easily get this hairstyle at your local hairdresser’s place. Short hair can be styled in so many ways. This is one classic hairstyle that has beautifully twisted curls. It gives a thick hair appearance and we love the bright shiny, easy appeal of this hairstyle. Short hair can cut off the years from your age. 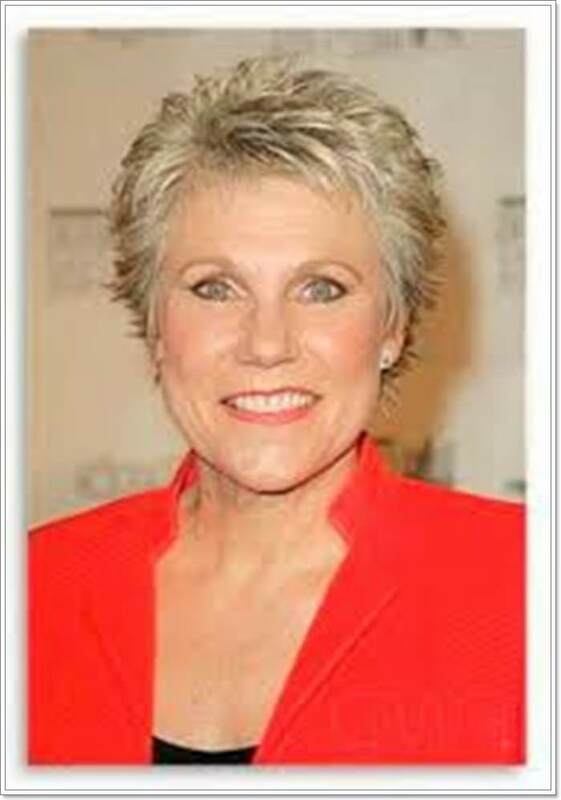 This short hair is definitely one of the interesting instances of hairstyles for women over 60. This haircut has framed the face perfectly and will look great with oval face shapes. Grace Hightower has worn daring hairstyles that have inspired many women to make bold choices. 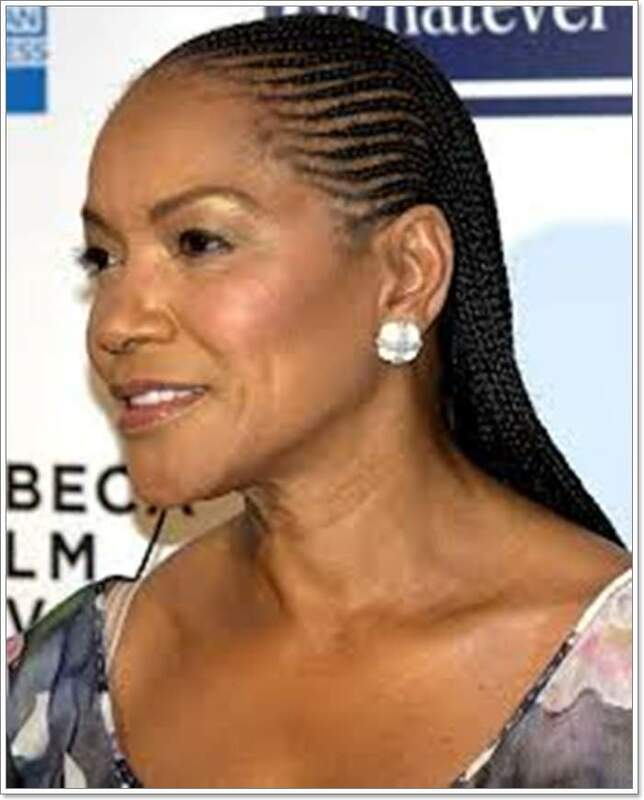 This cornrow has added so much flair to her look and is one of the absolutely fearless hairstyles for women over 60. 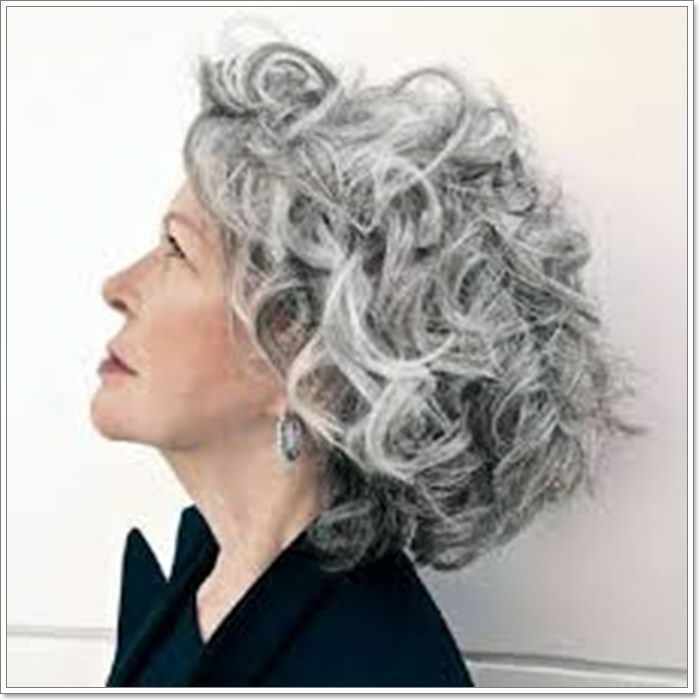 Grey hair curls are one of the choices of hairstyles for women over 60 that will never go out of fashion. You can curl your hair irrespective of any length and enjoy the held back hair. Recreate this hairstyle in your nearest hair salon and admire your gorgeous hair! When you reach a certain age the amount of hair you have will start to decrease. 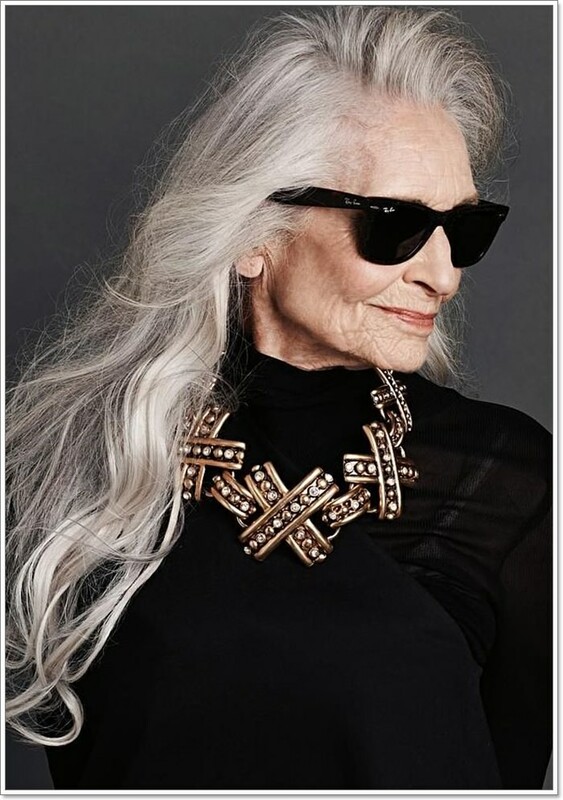 But if you are one of the lucky ladies to have a full head of hair as you age this look is perfect. Such casual hairstyles are very popular and easy on the eyes as well. This look is very alluring and easy on the eyes. 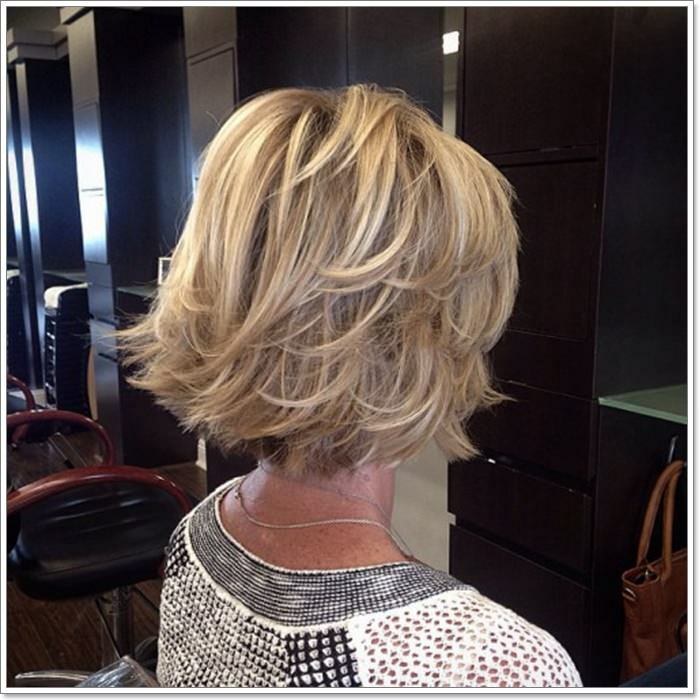 This is a great bob that has highlights of blonde and darker hair roots. We love how this hairstyle has enough volume and gives a fuller look. This is another great way to style your long length hair. Just create soft loose curls in your hair and you are good to go. The beautiful blonde hair color has added so much dimension to your hair. 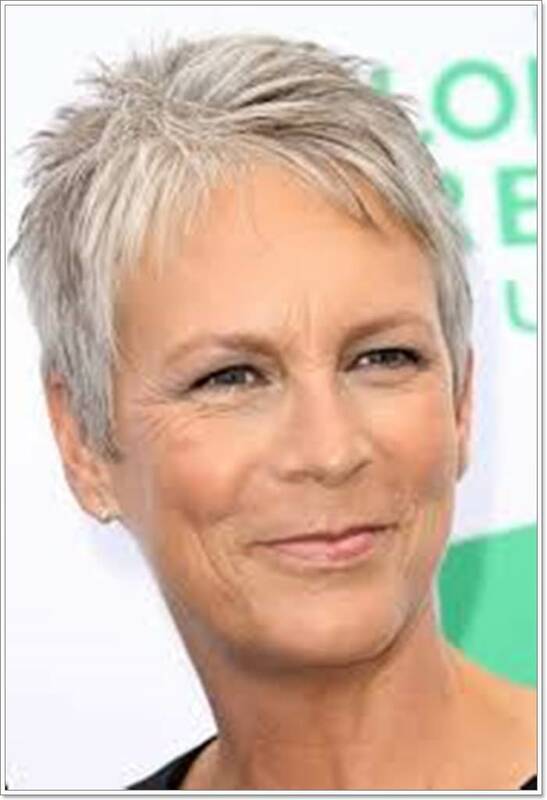 Jamie Lee Curtis has had this beautiful short pixie cut for so long. She wears it gracefully to every event. There is an element of ease in this hairstyle that we adore. We recommend this hairstyle if you desire short hair. This is one beautiful bob hairstyle that has been worn by so many women over the years. You can recreate this thick beautiful bob hairdo if you have thick hair. This is an elegant choice perfect for all occasions. 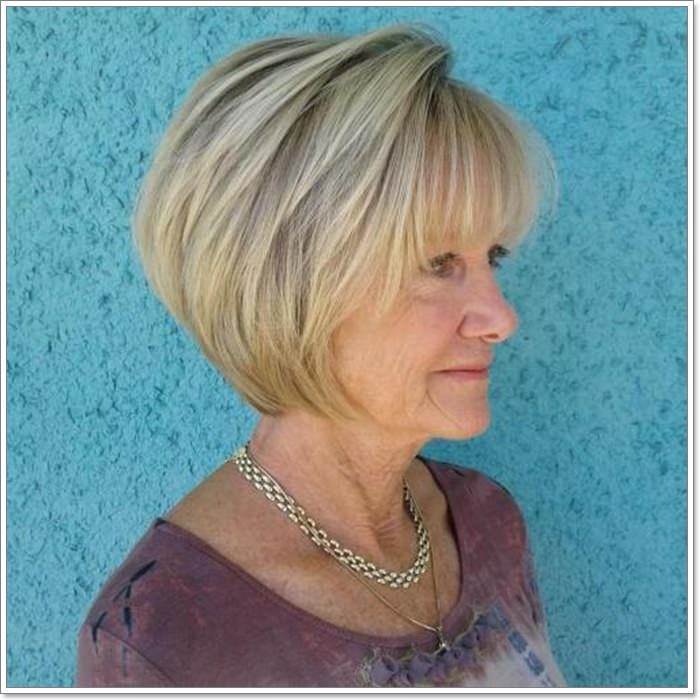 This layered short hairstyle is perfect as one of the most comfortable hairstyles for women over 60. We love the stacked hair as it has added so much volume to the top and back. The dark black hair at the base is contrasted by the blonde on the back. This basic bob is very vibrant and has a very youthful vibe. 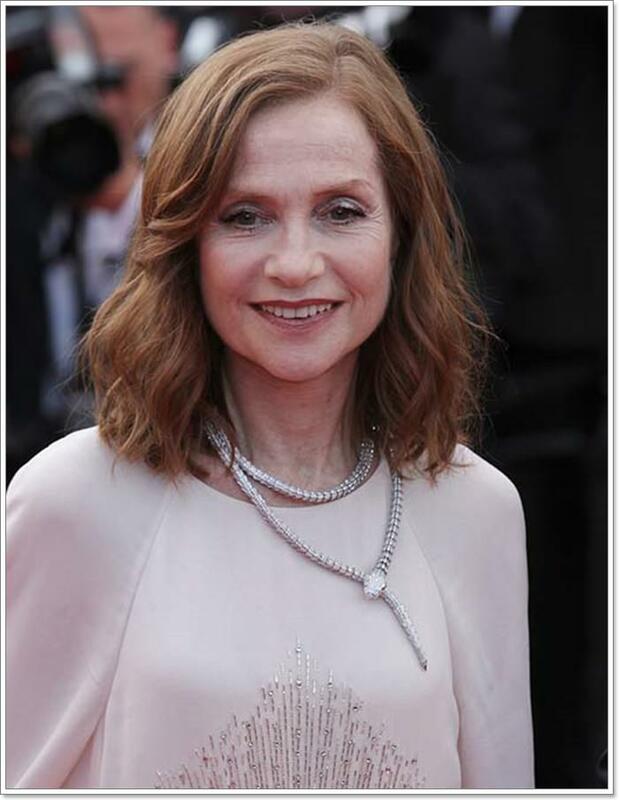 You can recreate this look to slash years off of your actual age. The bangs and soft falling hair on the base have made this hairstyle a must try. 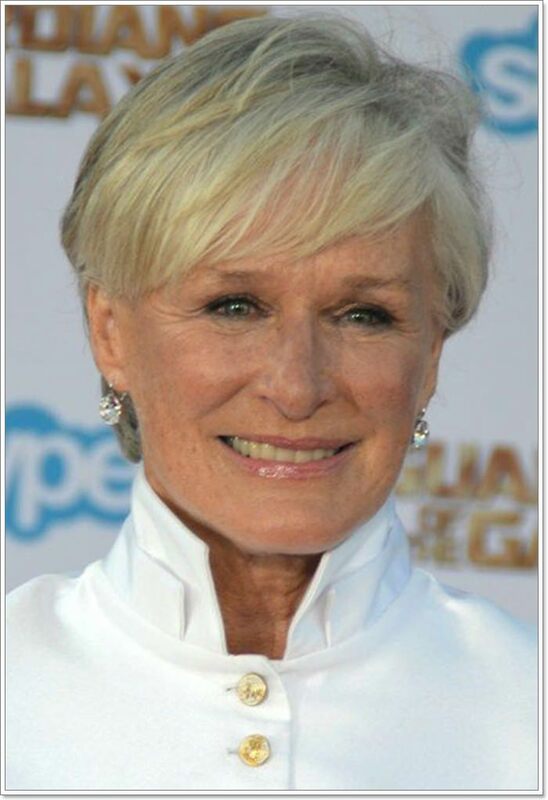 The ashy hair color makes this stylish and yet one of the best choices of hairstyles for women over 60. When you have fine hair you try to find ways to style them in a way that takes the glare off from this feature of yours. There is a certain panache about this look that makes us wanna stare at it. Keep it casually great and attain this simplistic look. The side partitioned hair creates a balance in the whole look and the straight hair makes this look very attainable. Try this one out for an easy everyday look. 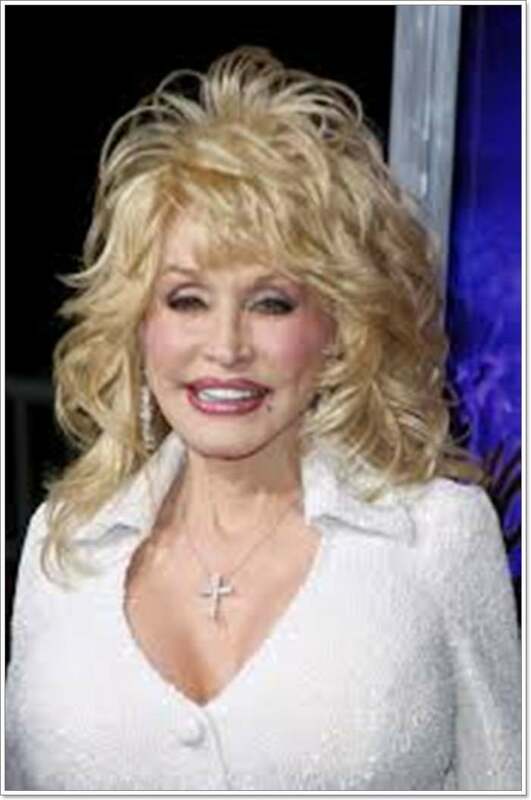 The American singer-songwriter has been known for her outstanding hairstyles. 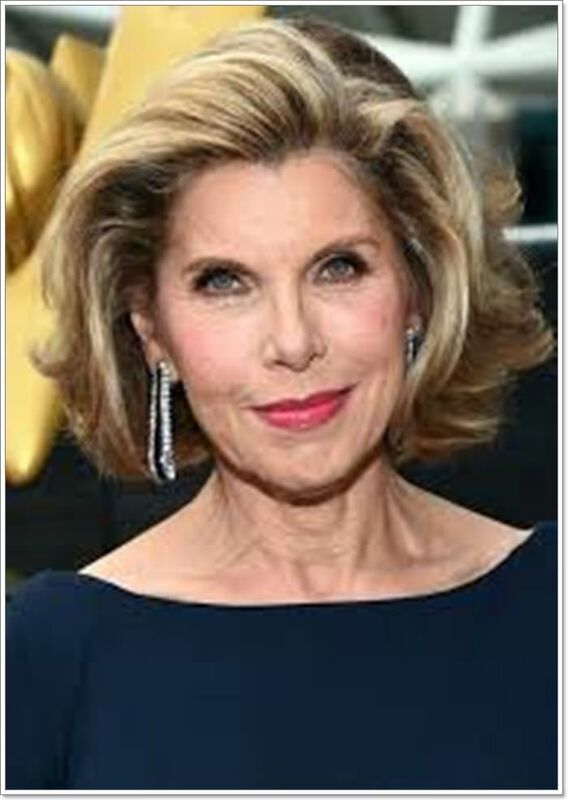 Her hairdos are perfect instances of hairstyles for women over 60. The hair has ruffles on the top that adds so much volume to the look. There are so many layers in this hair. They are styled in different directional waves and the hair on the forehead has made this look appropriate if you have a big forehead. Do you want to style your hair and conceal your large forehead? Then this is a perfect choice for you. The soft waves at the bottom of the hair make this a soft everyday wearable look. Getting full bangs that cover your forehead is a very bold choice. The great thing about this look is that it will effectively cover any forehead wrinkles that you might have! 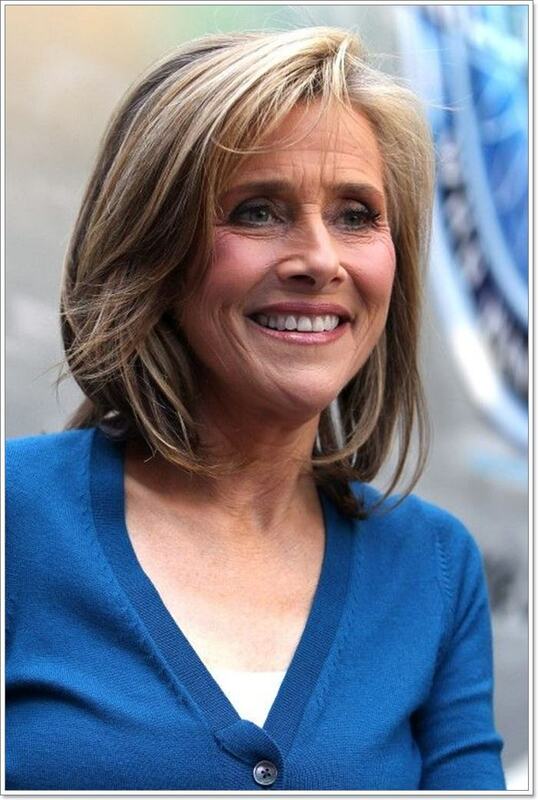 There are so many layers and waves here that just makes this count among good hairstyles for women over 60. Once you get bored of having fuller bangs you can sweep them to the sides and style them with some volume on top and straight hair. 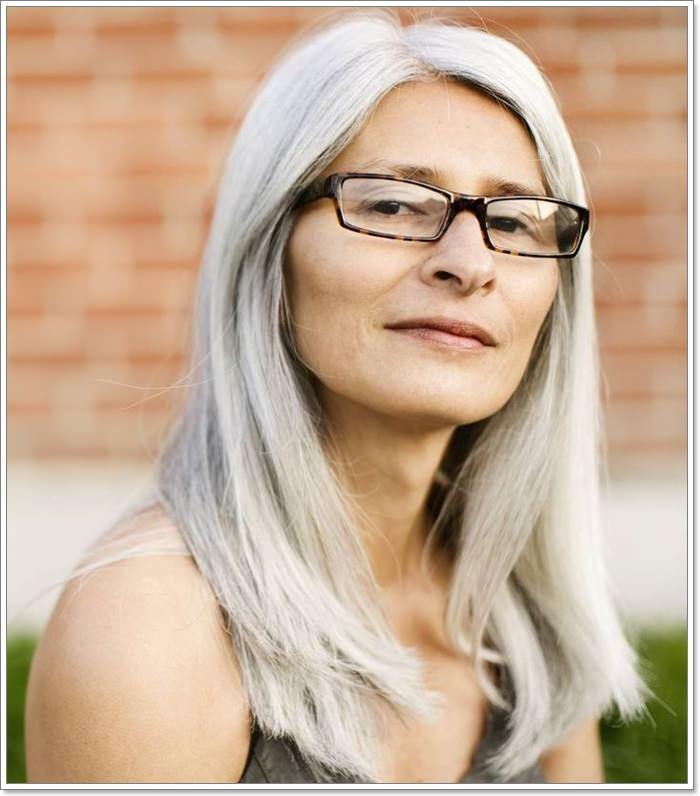 This hairstyle is perfect for women who wear glasses on a daily basis. You can opt for this full layers of hair if you want a textured hairstyle that is not too short. The hair has been styled away from the face and we love how it doesn’t fall on the face. The side partition and bangs add so much grace to the look. 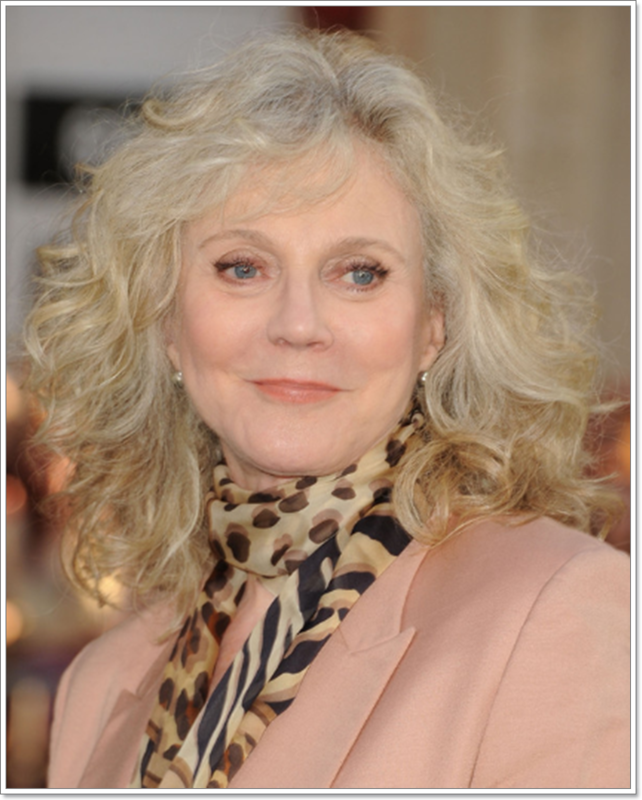 Catherine Deneuve, a French actress wore this look and we adore the volume that it has. The upward swept hair has added a glamorous touch to this look. You can also get inspired by her look and try to recreate as your own if you have short layered hair. You can opt for bold color choices to make this hairstyle an eye-popping hairdo. Here we have two hair color and hair texture for you. You can see how your hair will look with different hair color and layers in a pixie cut. Get soft sleeker hair or get a ruffled up hairdo with your choice of pixie hair cut. Choose hair colors like ashy blonde or brown to bring out the undertones of your skin and highlight the color of your eyes too. You are only as old as you feel and this statement could not be truer. 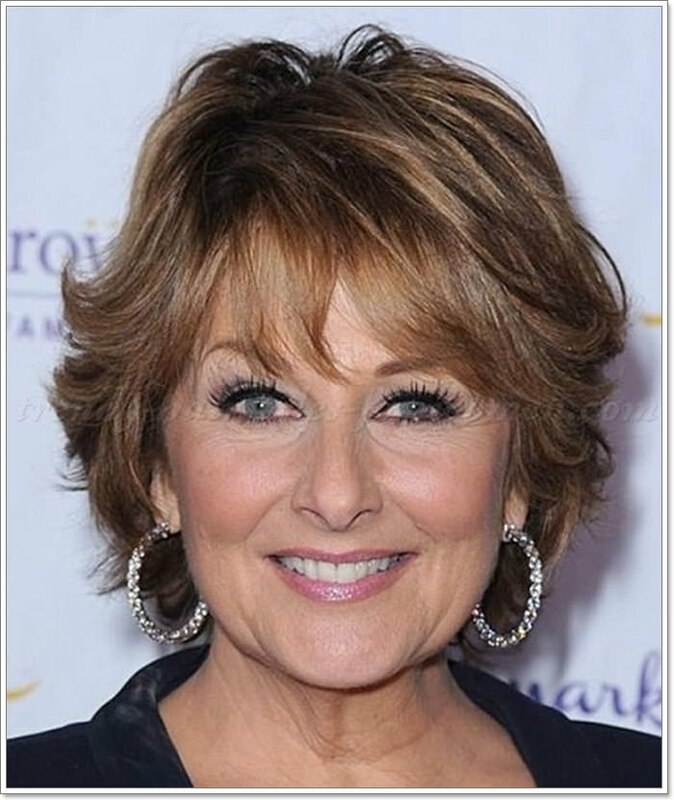 This is a very glamorous hairstyle that looks gorgeous on short hair.H ere are some perfect instance of hairstyles for women over 60 that can look glamorous and gorgeous with minimal effort. These glamorous hairstyles can be worn to any special event or even worn casually. This ashy blonde hair color looks so fabulous. 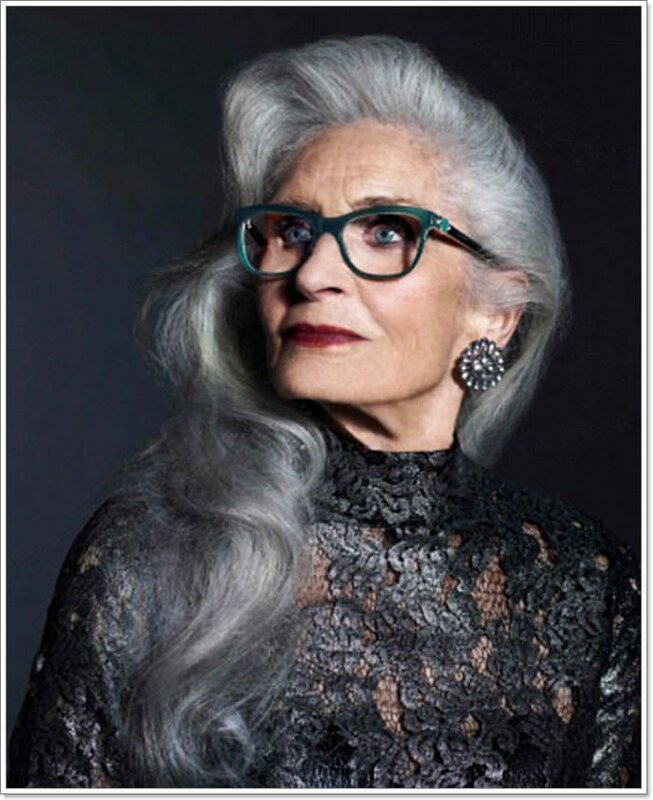 There are not many hairstyles for women over 60 that look as stylish and full of flair as this one right here. Don’t be afraid of taking on hairstyles that are as flirtacious and fun as this one right here. 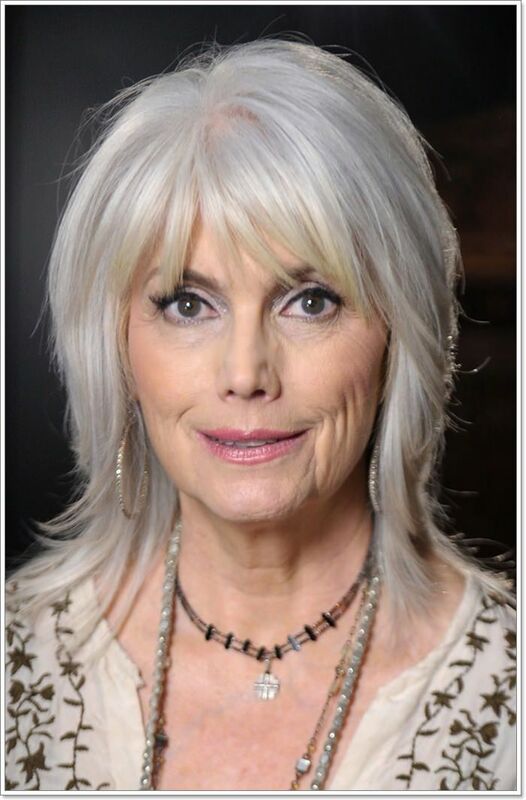 There are not many hairstyles for women over 60 that look as flattering and stylish as this one. The bangs look great and who doesn’t love some volume on top? We absolutely adore this hairstyle and highly recommend it. If short hair and highlights are your thing then this is the perfect look for you. 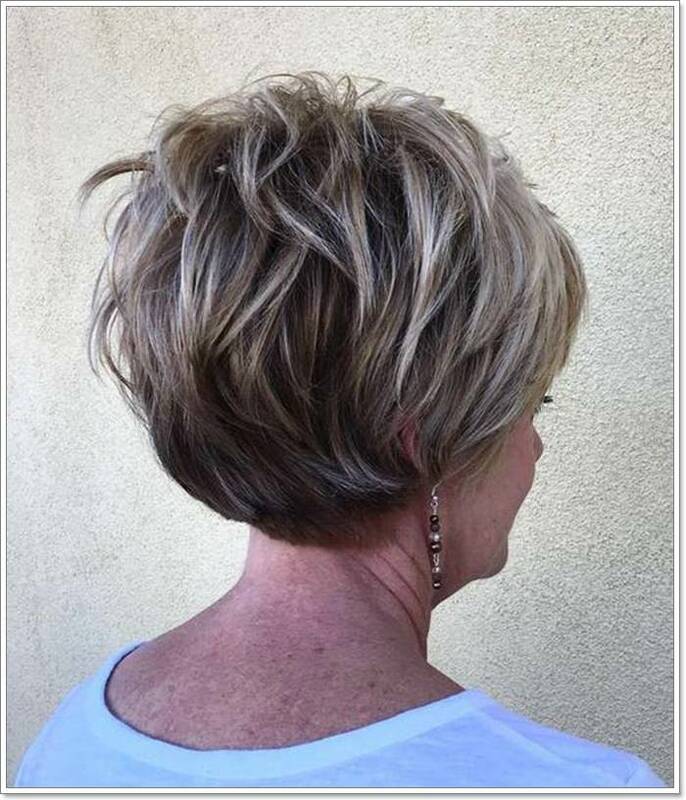 There are multiple layers in this hairstyle and the ash blonde highlights add so much dimension to this hairstyle. This brownish hair is perfect for all the boss ladies out there who want to stand out in the crowd. This hairstyle is perfect for women with a thick medium length of hair. There are slight curls that you can add in the ends of this hairstyle which will add a very soft touch to this look. 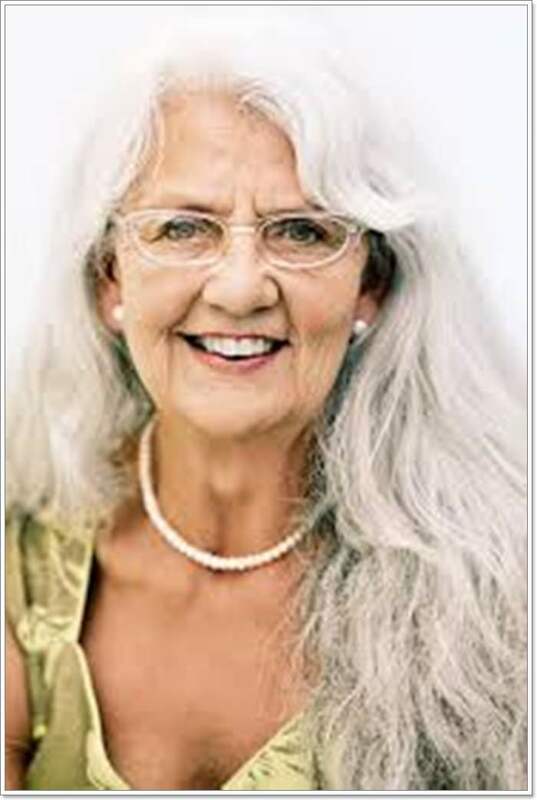 This multi-colored wavy hairstyle is one of the classiest hairstyles for women over 60. This hairstyle has so many dimensions and we love the brownish and blonde hair color. The waves on this hairstyles help to bring out your facial features. 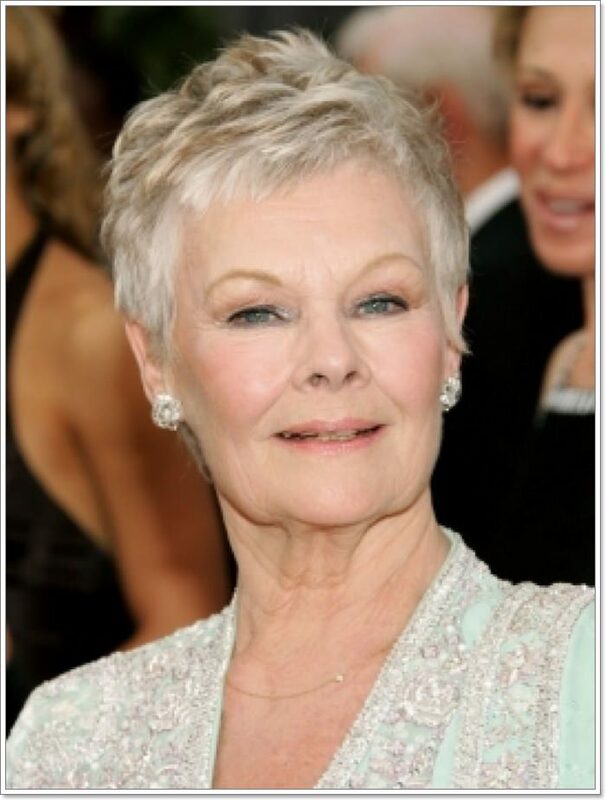 Get inspired by Jane and try on this very age and event appropriate hairdo. We love a hairstyle that has multiple layers in it. The layers have been added so well here and it has added a natural lift to the hair and adds so much volume. This hairstyle can be done by anyone who wants a fuller look. This look is so eye-catching and is a must try for all the fashionable ladies who are looking for a stylish hairdo to glam things up. The hair color has complimented this look very well and made it a very well balanced look. There is so much volume on top and it transitions into a softer look as we move to the ends. Try this look and thank us later when the compliments shower at you from all directions! As you grow older you need to take extra care of your locks to keep them as beautiful and luscious as they once were. To do this, you need to follow some hair care tips. Here are some tips for you to take care of your hair. If you follow these hair care and styling tips, you can maintain your lustrous hair and keep on experimenting with new hairstyles. The type of hairstyles you choose for yourself will definitely change as you grow in age. It can be a daunting task to choose for hairstyles in today’s world of numerous fast-paced changes and photoshopped hairdos. There are so many models and celebrities that make any hairstyle look glamorous in pictures. But as you try these hairdos in real life you will find it to be not so flattering and feasible for you. 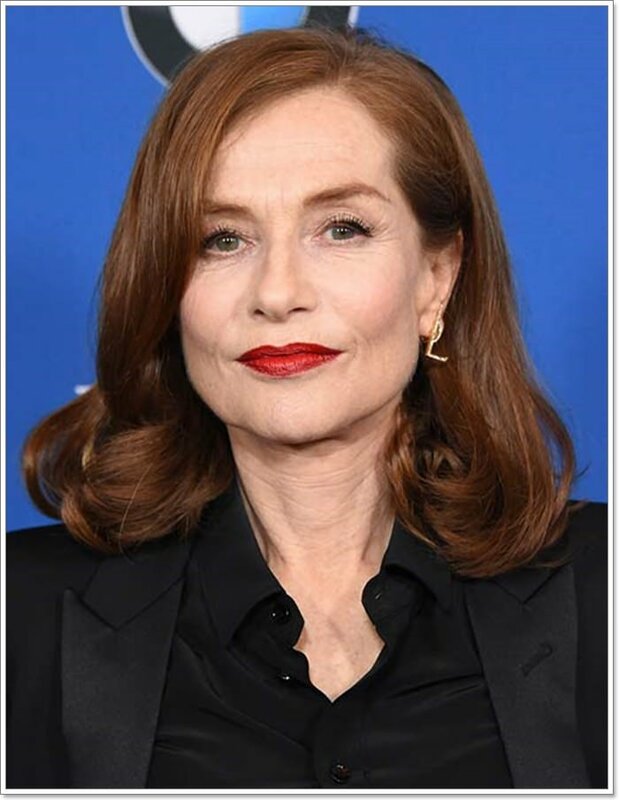 That is why we have this article in place to help you find the perfect hairstyle to match your age and accentuate your features as well. 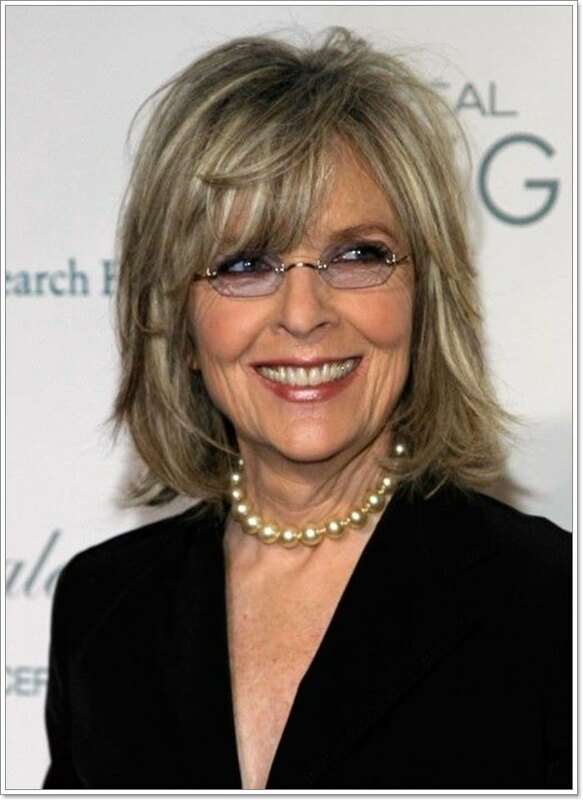 Whether you have grey hair, fine hair or thick luscious hair, there are many hairstyles for women over 60 that you can choose to look attractive. We hope that this article has helped you to find the perfect hairstyle that will suit your features. We have included hairstyle options for women with different facial features like round or long face. 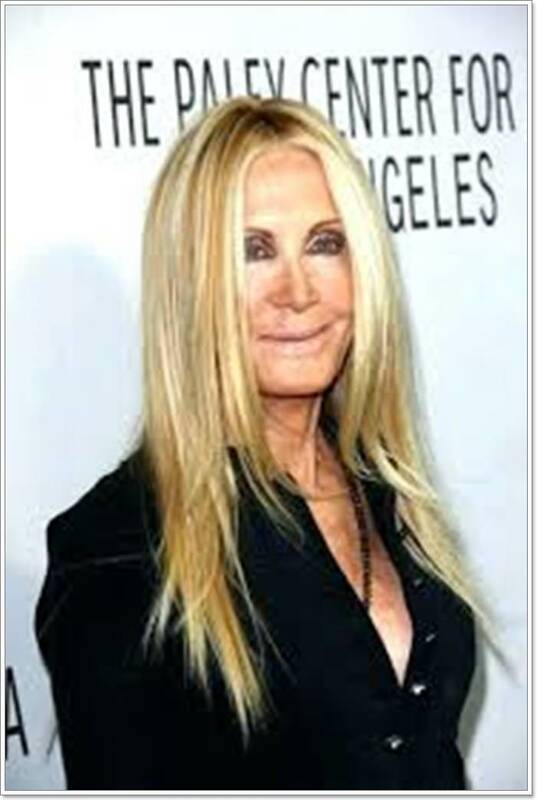 This article also has options for women with different hair color and hair length. Don’t shy away from trying a hairstyle that you adore by thinking about others opinions. Be carefree and try these awesome and gracious hairdos to look absolutely alluring!